After many years operating as a bagel bar franchise on the main street in Letterkenny we had a vision of opening a cafe where we could mix the best of a hot food cafe with a good sandwich offering. The “we” in this case is Pat & Amanda and this is very much a family business. With this vision in our mind we opened The Kitchen in Letterkenny Retail Park in November 2013. Of course we got some things wrong but thankfully it was a popular offering with our customers right from the start and has evolved to what we hope today is a great choice at great value. 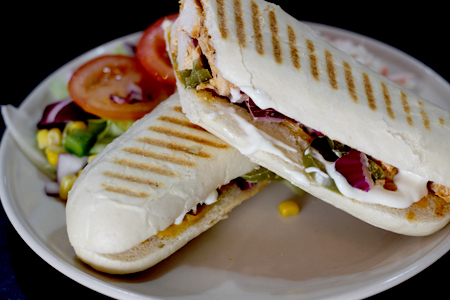 All our sandwiches, Panini’s , Bagels and wraps are made to order. Our chef Damien has been with us since the beginning and there is no doubt his commitment to everything being prepared and cooked fresh has been a key factor in the popularity of the cafe and we are continuing to develop the menu. There are at least 2 hot specials available every day. In December 2013 we converted our shop on the main street into the kitchen as well and now operate both shops with the same menu but with different specials in each place every day. At the weekends we provide a brunch menu on the Main St to cater for our regulars and visitors who get it hard to eat an early breakfast. In the Retail Park we have a very popular Sunday Lunch. When we opened the second outlet we reintroduced Greenbean Coffee Roasters as our coffee supplier and again this has been a very popular decision with our customers. We had dealt with them for many years through the franchise and knew they were an excellent brand and it was a great coup for us to bring them back as they are one of very few quality Irish Coffee Roasters. We try to ensure that our cafe is as hospitable as possible and everybody is encouraged to join in the crack and chat. But if you just wnt to sit in the corner and read the paper or use the free WIFI thats ok too.